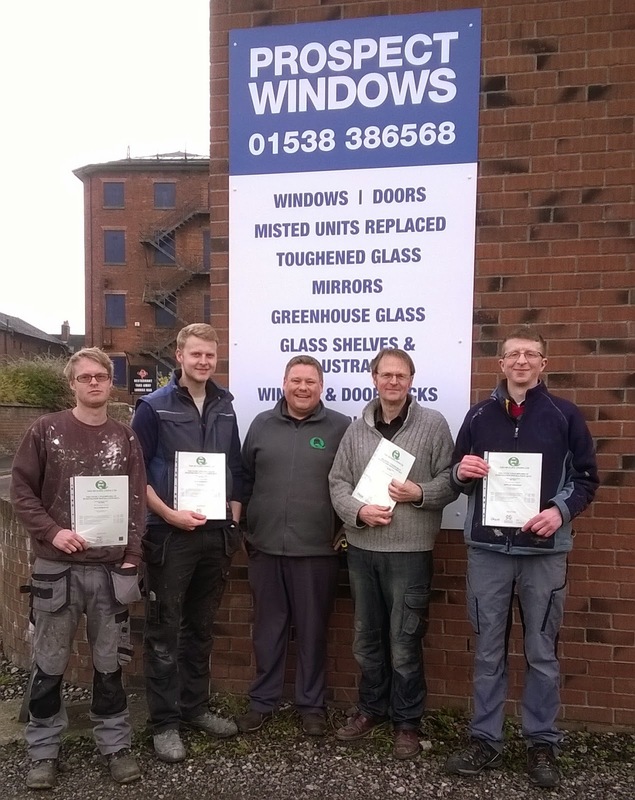 It was a family affair for Prospect Windows of Leek Staffordshire when they looked at personal development and meeting the new industry requirements for members of competent person schemes. Geoff Hodkinson, the business owner, and his three sons, John, Shaun and Ryan all registered on the GQA NVQ level 2 Fenestration Installation and Glass Related Operations Technical Certificate in 2013 and, working with GQA approved centre PM Training, achieved their qualifications in September of this year. Simon Smith, Assessor for PM Training said: “From a personal point of view it’s great to see companies like Prospect Windows welcome the changes within the industry and take the right steps to up-skill staff and recognise their competence levels. It was evident from the offset that John was very proactive and wanted to set the wheels in motion for all staff members to be assessed,” with Simon continuing “this approach was very refreshing and made the whole process a pleasure”. Prospect Windows were very impressed with the way PM Training handled the whole process, from the original sign up, through assessment and eventually certification. Geoff has already put himself at the top of the list to register on the GQA Surveying qualification and is hopeful of starting early in 2015. Simon said: “How Geoff has committed himself in the past, it is going to be a pleasure to work with Prospect Windows in the future”.